1. Pay Attention To Your Staff. In addition to paying attention to your staff, make sure that you update your company's equipment on a regular basis. This is a wonderful way to ensure that your daily operations are completed in a highly efficient, expedient way. Regularly updating your equipment also decreases the likelihood of work-related accidents. In the event that your company makes use of commercial freezer parts, you can obtain them from online retailers such as Online-reps.com. If you want your company to be more cutting edge and competitive than ever, you can accelerate the process by using proven growth strategies such as the ones listed above. By paying attention to your staff, updating your equipment, and putting your health first, you will likely find that you are able to see the ongoing business growth that you desire. Each week, me and my not so little girl try to do crafts together. This is my way of bonding and spending quality time with her and an avenue for her to develop her creativity. Since we went away for the weekend during the Easter holidays, we opted to make something with an Easter theme when we got back. 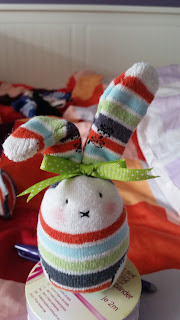 My daughter so loves everything cuddly and soft to the touch and I found this very great idea on Pinterest on making use of old baby socks to make bunnies out of them. So we rummaged through her closet and luckily found a few pairs that were already too small for her. I did most of the sewing since it needs fine stitching. My daughter did the filling and drew on the cheeks. If you want the detailed tutorial on how to make the sock bunny, click here.